You know you’re heading for the heavens as soon as your foot leaves the ground. The elegant bottom step to Preah Ko’s central section makes it clear that it’s a special place. Come in and explore it. 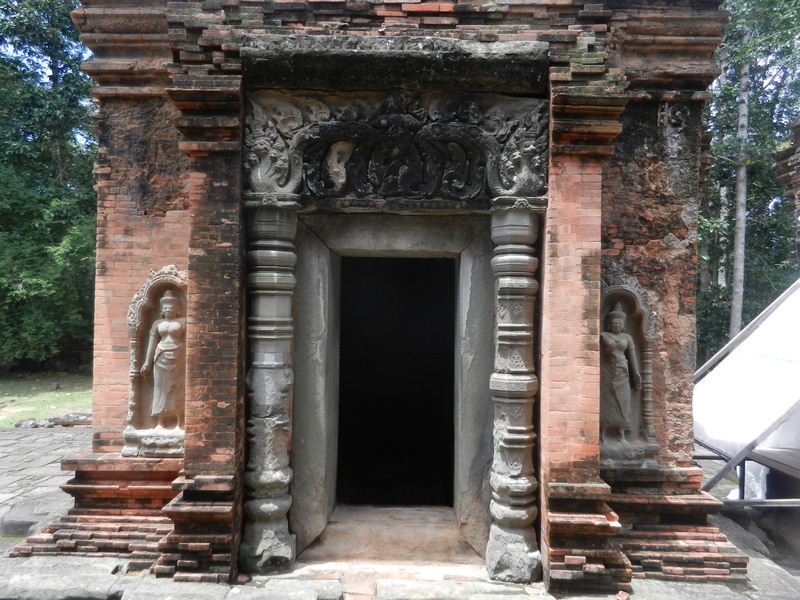 The previous post on Preah Ko focused on its power–King Indravarman I used its size and symmetry to help order the growing Khmer empire in its early stages, and to link his prestige with the dramatic Cambodian monsoons. 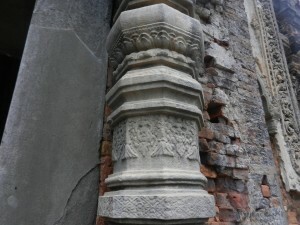 But this temple also set standards of elegance that have inspired Cambodian and Thai artists ever since. There’s so much to savor in Preah Ko’s central section that we’ll explore it over three posts. 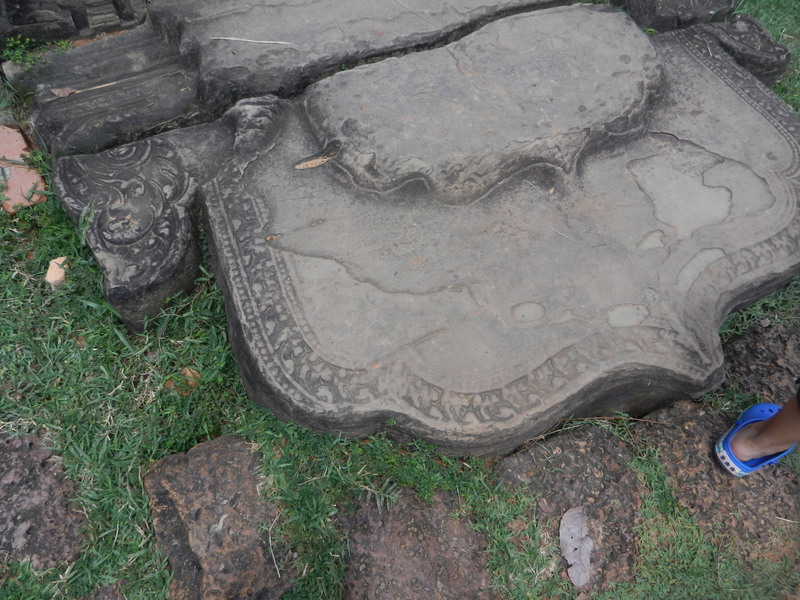 Above is one of the 6 shrines in Preah Ko’s central section–3 line a front row, and 3 are in the back. 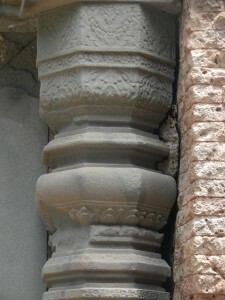 I’ve always enjoyed the style of columns that flank the door. 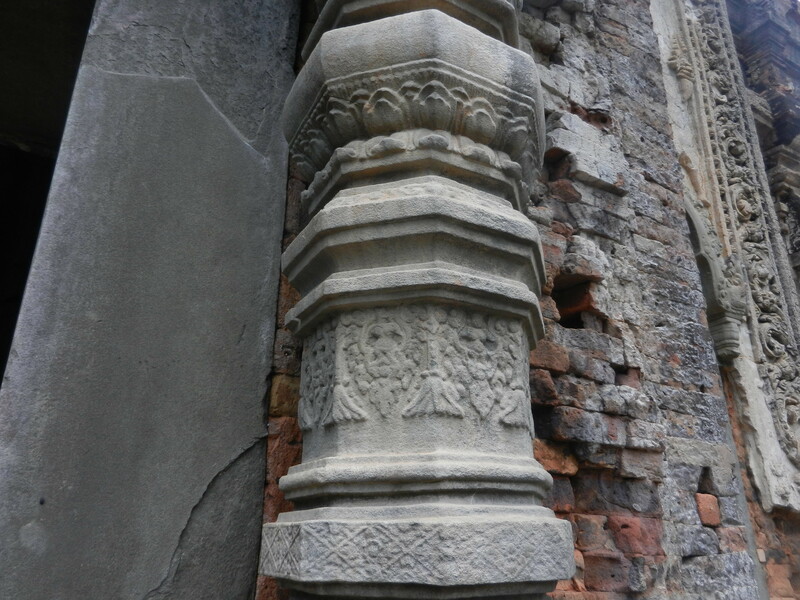 They sure don’t look like the classical columns that Westerners are used to. 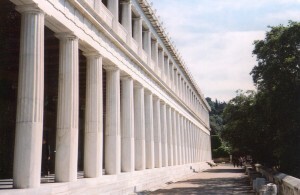 Above is the Stoa of Attallos II in Athen’s Agora. It’s actually a reconstruction that the American School of Classical Studies built from 1953 to 1956. It illustrates the type of column that Westerners have resonated with the most. They’re straight and abstract, and they’re in a linear sequence that’s so pure that the line becomes the main focus, rather than any decoration. Abstract shapes and linear relationships have been intellectual centers of gravity in the West since ancient Greece. But Khmer society was a different world. 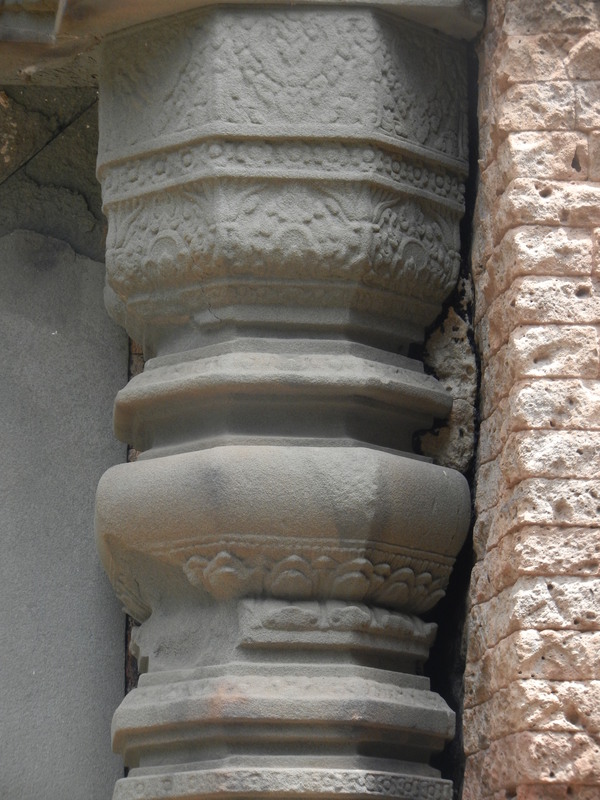 In Angkor, the decoration mattered as much as the form. Khmers got the idea of creating a profusion of forms on columns from India–in both lands it reflects the abundance of life forms in the tropics and the metaphysical energies that seem to generate them. The columns aren’t abstract lines–they pulsate with energy. The shot above shows a common Khmer motif: dense vegetation surrounding a human figure. The patterns seem animated, as though they could magically bring the rains that fertilized the rice crops that the growing Khmer state depended on. 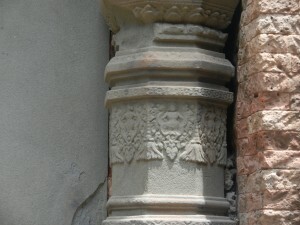 make these columns seem like they’re from celestial realms. They concentrate nature’s power and render it spiritual and benevolent. The finest Khmer art balances power and grace. Preah Ko’s central section does this in several ways, and it’s well worth lingering over. We’ll savor more of Preah Ko in the next post.